I’ve slowly been getting into the habit of reading again in the past few weeks – being off ill for a few days helped. 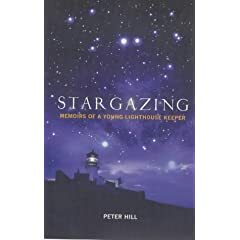 Just the other day, I finished Stargazing, a wonderful memoir by Peter Hill about his experience in the early 1970s of working as a lighthouse keeper. It’s an absolutely engrossing book, for a number of reasons. Firstly, it’s an original subject – how much do any of us know about lighthouses? Very little in my case. Secondly, it’s a period I know little about, even in Scotland. The world he creates and describes is miles away – sure, there are familiar places, and even one or two pubs in Glasgow referred to that are still in existence. But the 1970s seems like a different universe – the writer keeps in touch with his friends by landline phone and letter. The TV shows watched in the lighthouses are ones I’ve not really heard of. Watergate provides the political backdrop. There’s the looming threat of automating the lights, something this generation would think perfectly normal. It’s amazing to think how much the world has changed in just forty years. But thirdly, it’s so brilliantly and fluidly written. The language is warm, soft, and unchallenging (I read it in a few hours) but certainly not lightweight – there’s all sorts of fascinating ideas, emotions and pictures in Hill’s language, and he cleverly uses poetry and music to create a firm sense of place and time. In short, it’s a wonderful window into something that’s lost, and is quite compelling. Saturday 17 May 2008 in Uncategorized. You’ve inspired me to put this on my Goodreads “to-read” queue!